Hotel Inspira Santa Marta, Lisbon. Inspira Santa Marta Hotel Lisbon. The Inspira Santa Marta Hotel is located in the very heart of Lisbon, an excellent position very close to the Avenida da Liberdade. 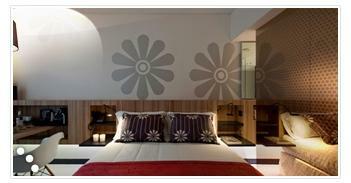 This hotel is characterised by an ecological philosophy, following the old doctrine of Feng Shui. Your sensations will be so stimulated, as well as your creativity and productivity! There are 2 conference rooms, with a capacity of 110 people, and a studio ideal for 45 people. There are also special green conferences/meetings characterised by particulars features like paperless procedures, energy saving measures and low impact audio-visual equipment. Other very particular details and services of the hotel include a warm fireplace, a retro and minimalist décor, an extensive cocktail menu and an area ideal to encourage the work of local artists. We also have a great restaurant, the Open, that proposes a new idea of food, based on Mediterranean cuisine: show-cooking, workshops, demos, wine tasting and many other activities. For the fitness lovers, we are also equipped with a Spa furnished with sauna, steam bath and Jacuzzi (available starting from the end of June). There is also a fitness room. For your cars, we have a garage with 86 parking spaces.